Well, those paying attention will have worked out or seen that I have done the mud run! As promised this was tweeted where possible and after the event was mentioned on Facebook. Owing to a busy and fun weekend with my gorgeous other half, Holley, I’ve only just sat down to write a little more about it. So here we go: as I said it took place last Saturday morning in Tunbridge Wells. The location was a large estate, and the event was run and manned by a group called the Major Series. They had laid on a brilliant route that was incredibly well sign posted; I can’t fault the organisation of the day at all. I arrived early with Holley, found out where I needed to go, and relaxed to wait for the rest of the Gravity group. There was a decent selection of songs playing on a sound system to get everyone pumped, a good few food and drink stands. Moma’s porridge even had a stall giving out free porridge to the runners! We pinned our race numbers onto our shirts and strapped a little band to our shoe. The band had a chip in that was picked up by sensors at the start and finish lines so we could find out our own personal times (mine was 2 hours and 15 minutes if you’re interested). The runners were split into waves that left every 15 minutes. When our wave was called we went into an area set up with a stage and sound system where we had a guy taking us through some warm up exercises and doing some call and response phrases with the group to get everyone ready and in the mood. Then down to the start line and off we went. As promised there were a lot of obstacles en route; muddy ditches to wade through, beams to climb over or crawl under, cargo nets to climb over, hills to run up and down, and a few other awesome bits thrown in for good measure. All around the route we had people from for military who were shouting words of encouragement, and keeping an eye on things. After 2 hours and 15 minutes, I ran up the final hill, and smiling as I saw Holley with a camera poised I shouted as I ran full tilt over the line, a huge sense of pride and achievement filling me. A rather wet and muddy Tom after crossing the finish line! Its fair to say I really loved the experience, and am keen to do more in the future. The atmosphere was great, the exercise and sense of achievement were awesome, the whole day is something I will remember for a very long time, for good reasons. Oh! I nearly forgot the other important part: I managed to raise just over £300, which is all going to Crohn’s and Colitis UK. I think my Just Giving page is still active, so if you are reading this and wanted to donate after the event do feel free! My page is here. 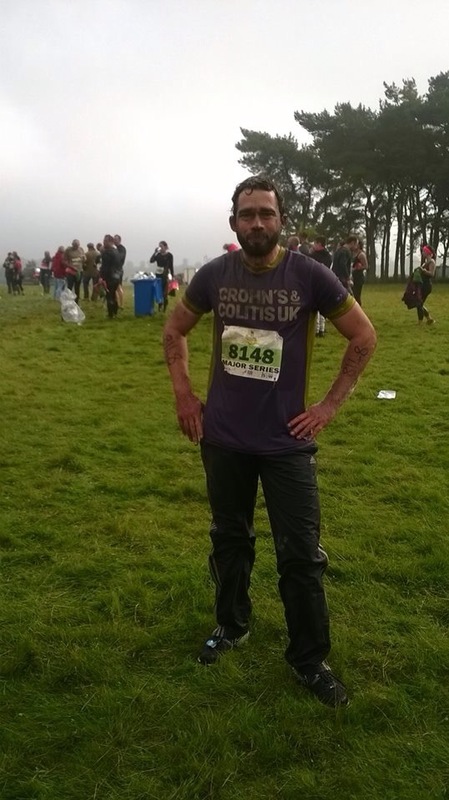 This entry was posted in Awareness, Crohn's Diary, Exercise, Fund raising and tagged Crohns and Colitis UK, Determination, Fund raising, Major Series. Bookmark the permalink. 2 Responses to Smashed the mud run! Yay! What a triumph, only a few months after the big surgery!